Oil-Electric: Old Budds Never Die! Port Townsend, today. It is a tribute to Edward G. Budd and his visionary confidence in the use of expensive and difficult to work with stainless steel in the manufacture of a railcar. I’m not sure how many are still in use around the world, but two more of Budd’s magnificent machines have narrowly escaped the cutters torch. Alaska Railroad last used these cars on the Talkeetna to Hurricane run. As you can see, both cars have been modified significantly since they were first purchased by the New York, New Haven & Hartford – New Haven – way back in 1952/53. Portland’s TriMet system includes bus, the light rail Metropolitan Area Express (MAX,) the Portland Street Car, and Westside Express Service. This service operates Diesel Multiple Unit (DMU) cars. Those of us with whiskers know that to be a permutation of the Budd Rail Diesel Car. WES operates over a lot of re-cycled Union Pacific, former Southern Pacific rails in Washington County west of Portland, Oregon. Specifically, of the 14.7-mile railway, TriMet owns the right-of-way from Beaverton to Tigard, Oregon, while the Portland & Western Railroad (P&WR) leases tracks and structures from the Union Pacific. From Tigard south to end of line at Wilsonville, the Oregon Department of Transportation (ODOT) owns the right-of-way, while the rails and structures are owned by P&WR. 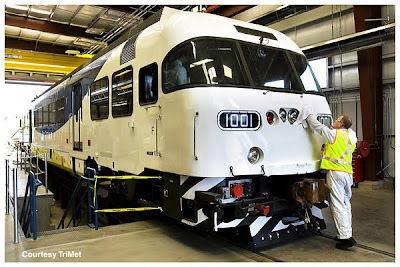 Employees of Portland & Western Railroad operate the WES DMU cars over the entire 14.7-mile route, not always in harmony with TriMet over horn blowing! P&WR is owned by another familiar name in second hand trackage, Genesee & Wyoming, Inc.
Westside Express Service is now one year old, and here are the performance numbers. Originally scheduled to open in September 2008, opening was delayed several times and eventually to February 2009 due to technical and other difficulties, most notably the failure of Colorado Railcar (CR). TriMet lost $3 million from the delays and from its financial support of CR, which included paying CR's suppliers and providing "rail engineering expertise and on-site technical assistance." They provided bailout funds to CR, paying rent, phone, and power bills, and ultimately taking control of the failing company long enough to take delivery of its vehicles. Can you imagine the Edward G. Budd Company operating in this manner? Well Colorado Railcar didn’t make it. It was liquidated in 2009. A new company has emerged, US Railcar. One can only hope they are successful. It’s a shame that we have to go offshore, hat in hand, for rail equipment. There is no stronger testimonial to the integrity of a company’s design, workmanship, and quality of rail cars more than 50 years old, brought in to bail a youngster out of trouble! I wonder how many Budd RDC’s could have been recycled, in a shorter span of time, for a lot less money than TriMet forked out for this experience! 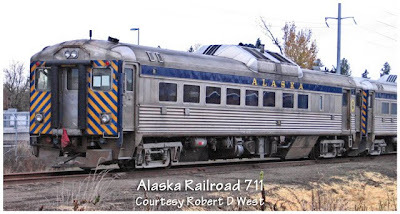 Railroad Stuff: Alaska Railroad #711. Originally built as New Haven 121, RDC-2, September 1952, serial number 5609. Became Penn Central #82, January 1969. AMTRAK #36. 1973, ConnDOT July 1980, to ARR 1986. Rebuilt at Morrison Knudsen re-powered with Cummings 300 hp., Voith transmission May 1987. Retired 2009. Sold to TriMet WES 2009. Alaska Railroad #702. Originally built as New Haven #129, RDC-3, May 1953, serial number 5819. Post Office compartment removed. 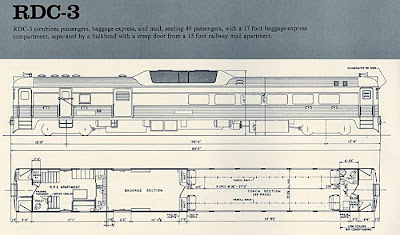 Became Penn Central #96, January 1969. PennDot #9171, PAT 1976, ARR 1985. Rebuilt at Morrison-Knudsen, re-powered with Cummings 300 hp, Voith transmission January 1986, Retired 2009. Sold to TriMet WES 2009. 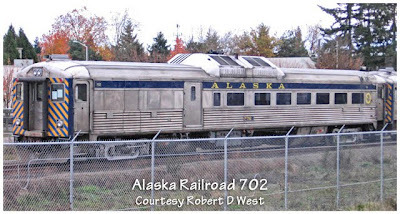 Our “Thanks” to Robert D. West for providing photos of Alaska Railroad RDC’s shot in Wilsonville Oregon, November 2009, awaiting rebuild for WES. 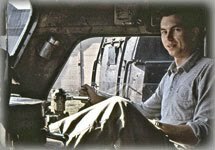 Robert has amassed a large number of interesting Pacific Northwest rail images, including hard to find Spokane, Portland & Seattle at his site.